I am sorry if he went to hell, but he had plenty of chances. Romans 2 will be his judge now. At the Great White throne Revelation 21. This is the judgement of the " Dead" and those who think "works"will save them. He is one of the dead and will be judged for his evil works and even the dead works he may have thought he was doing for all of "humanities good." My judgement was on the Cross and was in Jesus Christ's punishment and now partake in His :life"( I do hope Mr. Hitchens turned from his folly at the end and repented?) Praise God. : either way for his( God's) justness .My "A" unfavorite is Atheists. I do not want them to go to hell, but especially in westernized countries where most live: They are really w/out excuse. So I really have some news today. 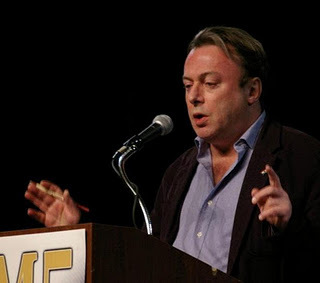 This is Christopher Hitchens- One of the darlings of "The Nothing Created Everything Brigade." And a card carrying Atheist-"so called" religious cult member. Sorry for how he died, but am not too saddened because it causes everyone including the member of this" religion of God Hatred" to give pause and wonder? What if I am wrong? What if there's more? To read more, Please check on title and go to link. Read the pitiful comments and pray.......... Not for him-too late for that, but for others than hath chosen his Godless path still with chances to acknowledge the Saviour. On a group on Face book, I wrote a small post of dealings with day to day bipolar and my thoughts of confusion it brings me. Thanks Carrie, my point was the confusion I get from people saying bipolar is illness, others saying it is not, you have control over it. Which is it? I have had it since I was 2-4 years old and did not even get told until I was 40 I had it, but something was wrong. And I do get Psychosis.Then I get told the devil has no part and then I really think he does or maybe it is just mania thinking" that wow the devil is really picking on me so I must be extra spiritual" Even to family saying I am like Eve blaming my bad behavior on the devil. But in my own experience I have done as you said and he has fled or I just feel better because it is like a placebo.I had thought that my bipolar either side depression an or mania kick in and then tthe devil takes it over and either he or God uses it. then I think it is my own imagination and go into unbelief and think I have never been right with God except for my illness so it is my illness not me and then told self esteem, I would not be manic on my meds, blah, blah. I read different in books. That is my experience with the whole thing. and then Christians not understanding or believing. I do not know how people find the time to do this stuff. I just want to be able to read my Bible.Always something must be given up. (I have done journaling, but just another thing "I have" to do.) and to keep track of which gives me anxiety. I get overwhelmed if I have too much of anything. ( Example: I am on stumble and many people have likes in K's, I am bothered that I am going over 100 items and will want to get rid of some favorites) I know alot of people get a lot out of it, but I do not like reading what I write. May be the bipolar. I have a blog, but even hate reading it to edit. causes me anxiety. I am doing a series on my bipolar, hoping to help someone so it is kind of journaling in a way, but I do do other subjects. Why I could never settle on any college degree, I am up and down back and forth loving everything and staying home I can be that-everything. this is just what I am dealing with now in my life. Craft for christmas/Frugal Hobbies #6 From August 2011 posting. 1. Place Bounty paper towels on the table to keep it tidy. 2. Cut several Bounty paper towels into long 2.5 centimetre strips. Stack the strips on top of each other and tear into smaller sections. 3. Paint the Bounty paper towel pieces with green tempera paint and allow to dry. 4. Place one green piece over the tip of the cone and attach with straight pins - just make sure the straight pins are handled with care. Then move to the bottom of the cone and attach the pieces, moving around the bottom row. Repeat, moving up to the top of the cone. 5. 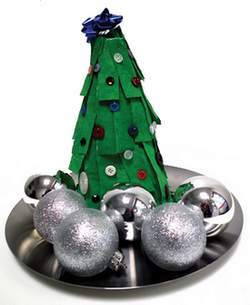 Decorate the tree with "ornaments" by attaching coloured buttons with straight pins. Pin a festive bow to the top and place the tree on Bounty paper towels for a "snowy" presentation. 6. Painting can be messy. To help with the clean-up, wipe down all surfaces with paper towels - they have the strength, absorbency, and cloth-like durability to clean up the mess with ease. Credit goes to Bounty towels. Website where I got idea link above.